If I claim it will be the year of Nicole, will that make it so? I like the show The Middle. I feel like I can relate to Sue Sue Heck. If you’ve never watched the show, yes, that is her name, Sue Sue Heck. Sadly, she’s also kind of a nerd/dork. I hate to say that because like I said, I relate to her. But truth be told, I’m probably a nerd/dork too. Every year, usually school year but still, Sue claims it to be the Year of Sue. Of course, sadly, this is the last season. I’m mad about that. She’s also potentially getting with the guy but they are still keeping him at arm’s length from her so I’m upset about that too. GRRRRRR! 2017 was an interesting year. There were a lot of plot twists. There were a lot of challenging moments. I even grew some in there. It’s what happens. I’ve always said that life is like a roller coaster. There are ups and downs and all arounds. And of course throw in those plot twists and you have a really fun ride, right? I’m not one who makes New Year’s Resolutions because like most I don’t see them through. Here’s the thing… I kind of made a New Year’s Challenge last year. It was to be happier. I really think I want/need to keep that mantra going. Another thing about Sue Heck, nothing gets her down. She doesn’t make a team, she just tries out for the next. Someone makes fun of her (an old episode I saw last night she was carrying all her books in her book bag (backpack) and fell backwards and “turtled… didn’t get her down) she just keeps going. She’s Miss Optimist. I think once upon a time I was more of an optimist than I am these days. I’ve encountered a lot of people who have put me down throughout my life. I’m pretty sure it has eaten at me and eaten a lot of my optimism away. Not a good thing. There is a lot of uncertainty my family has going into this year. A lot of ifs, ands, or buts. Not going to lie, it’s a little bit stressful. I read once that successful people look a challenge in the eye and take it in full force. Once upon a time that was me too. Not so much as of late… but again, that’s another thing I’m working on. p.s. if you want my look, drop the temperature down to the 20’s. Get up and still have your pj’s on (shorts and a t-shirt if you’re interested, haha). 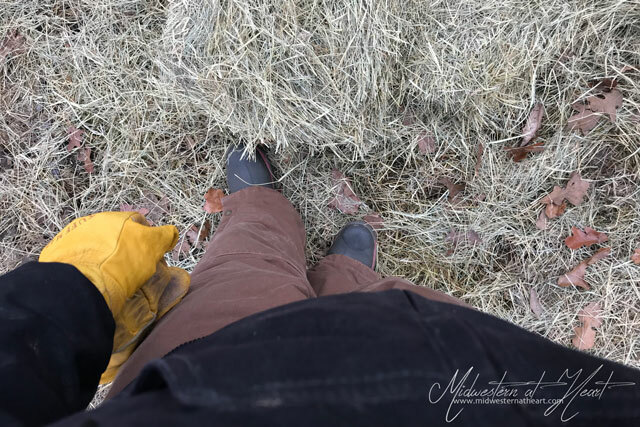 Throw on Key Bibs, a Farm store brand heavy barn coat (black obviously), and Muck boots. Don’t forget the leather gloves. You’ve never lived on a farm if you haven’t gone to do chores in your night clothes and mud (Muck) boots. ← This Cold Stuff is For the Birds! Every single year I say that it is going to be my year… it hasn’t quite worked yet but I am still hopeful. I hope that 2018 brings us both amazing and wonderful things!